Bannockburn Day is a Scottish observance held on June 24 every year. It commemorates a significant Scottish victory in the First War of Scottish Independence that is considered an important landmark in Scottish history. The Battle of Bannockburn is considered to be one of the most important battles during the Wars of Scottish Independence, a series of military campaigns fought between Scotland and England in the 13th and 14th centuries. The wars began in 1296 and by 1304 England had conquered most of Scotland. But in 1306 Robert the Bruce became King of Scots and resolved to win his land back. By 1314, Bruce had recaptured most of Scotland’s castles. In the spring 1314, his younger brother, Edward Bruce, besieged Stirling Castle that was one of the most important castles still held by the English. In response, the English king sent troops to relieve the castle. Robert Bruce prepared to prevent English forces from reaching Stirling and intercepted them at the stream of Bannock Burn on June 23, 1314. The two-day battle resulted in the decisive victory of the Scottish forces. 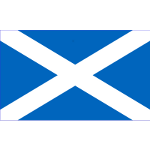 Although England didn’t immediately recognize the independence of Scotland and the war lasted for 14 more years until the Treaty of Edinburgh—Northampton was signed, it was the victory at Bannockburn that was the first major step towards the full independence of the Kingdom of Scotland.